Vitamin D increases the absorption of calcium, magnesium, and phosphate in our intestinal track. Thus it’s directly related to bone health (osteoporosis), cell growth, inflammation reduction, and neuromuscular and immune functions1. Dietary sources of vitamin D are limited to fish liver oil and the flesh of fatty fish2. Most of the milk (but not cheese or ice cream) in the USA is voluntarily fortified with 100 IU/cup. In Canada, milk is fortified by law with 35–40 IU/100 mL and margarine at 530 or more IU/100 g. As we’ll see shortly, anyone who lives in Canada needs supplementation, at least in winter. In many countries breakfast cereals, orange juice, yogurt and margarine are fortified. May I ask for your help? In which country do you live and which foods are fortified there? The third and most natural source is our skin, when we expose it to direct sunlight3. More specifically it’s the UVB component of sunlight that stimulates the skin, and it’s strongest in summer, at midday, close to the equator or at high altitude. If you live between the equator and 30° latitude, your skin should be able to produce enough vitamin D all year round. If you have light tan, expose your face and forearms to the midday sunlight for 15 minutes (without sun lotion). And if you are older or have dark skin, double the exposure. People with pale skin need only 10 min. For people living between 30° and 50° degrees latitude, you will need additional exposure time in spring and fall, and even more in winter. And for people living above 50° latitude (most of Russia, Canada, and any place north of Prague), the sun is so low between October and March that your skin cannot produce vitamin D. The same applies to smoggy cities like LA, Delhi, Beijing, Mexico City, etc. And for people wearing clothing over their entire body. The need for sun exposure for vitamin D production is at odds with the prevalent advice to avoid the sun “because it causes skin cancer”4. I was unable to find clear recommendations by any reliable sources. Since I live in northern Germany (where the sun is never really intense), my personal philosophy is simple: enjoy sunny days to the fullest while avoiding sunburn at all costs. When we travel to sunny locations, I use sun lotion, and I wear a hat and sunglasses. At high altitude I use all three extensively. But still, I try to be outside as much as possible. It’s the sun’s UVB component which stimulates vitamin D production, but sunbeds emit primarily UVA light. So sunbeds are not a viable way of producing this important vitamin. The numbers above refer to the total amount of vitamin D needed by the body. These amounts may come from any combination of natural foods, fortified foods, or the amount generated by sun exposure. However official recommendations usually assume that a person gets no sun exposure. This is probably due to the fact that there are currently no widely agreed-upon guidelines about what amounts of sun exposure are safe against skin cancer. There are no additional needs for pregnant of breast-feeding women. In Germany vitamin D is prescribed to all babies aged 0–12 months. Regular vitamin D over-supplementation (please consult the table above) usually leads to elevated calcium values, which in turn leads to vascular and tissue calcification, which eventually causes damage to the heart, blood vessels, and kidneys. It also may lead to kidney stones. My wife and I were both diagnosed with vitamin D deficiency. At different times, by different doctors. In both cases the prescription was Decristol, one pill with 20000 IU (!!! ), once per week. Initially I was concerned, since this value greatly exceeds the maximum daily safe amount. We supplement just once per week, so everything is probably OK, but I’ll be watching my vitamin D and calcium values very closely after our next blood test. Interesting fact: Excessive sun exposure does not result in vitamin D overdose. It turns to that sustained heat on the skin inhibits the vitamin’s production6. Our bodies are so amazing! Vitamin D deficiency is widely spread, even in industrial nations, and it affects vegans and non-vegans alike. 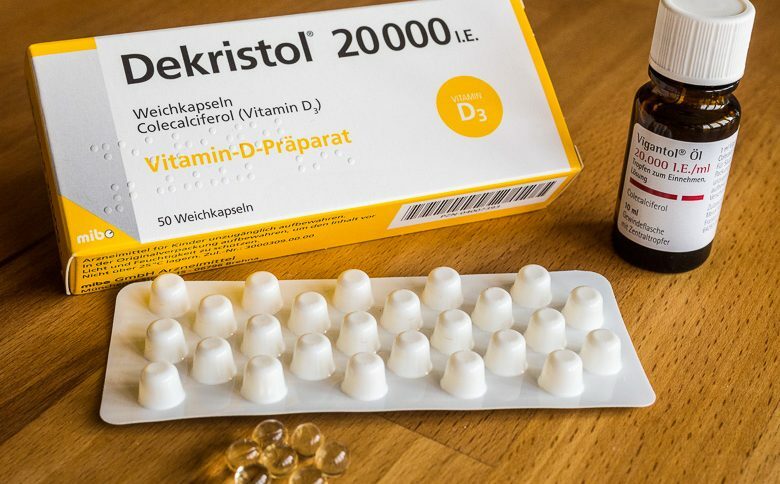 In Germany, vitamin D supplements require a prescription, which you will receive if your blood test indicates a deficiency. I paid 35 EUR for a 2-year supply of pills (one pill per week, October – March). Vitamin D is fat-soluble, so take your supplement together with a fatty meal. Vitamin D inadequacy has been reported in approximately 36% of otherwise healthy young adults and up to 57% of general medicine patients in the United States. The numbers in Europe are even higher7. To become bioavailable, vitamin D needs to be converted into 25-hydroxyvitamin D, aka 25(OH)D, by our liver. So to know whether your body receives enough vitamin D, you need to test for the amount of 25(OH)D in your blood’s serum. In my recent blood test in Germany, the test result was presented as “VD25”, and the test cost me 19 EUR. 125+ 50+ Elevated values of vitamin D lead to elevated calcium values. This in turn causes vascular and tissue calcification, which eventually causes damage to the heart, blood vessels, and kidneys. It also may lead to kidney stones. National Institutes of Health, Office of Dietary Supplements "Vitamin D Fact Sheet for Health Professionals"
This site explores the facts behind the vegan movement while speaking a language that everyone can understand. All claims are linked to their scientific sources, so dive in as deep as you want. This site is still quite new. Explore as much as you like, but please understand that the content is not yet as complete as I'd like it to be. I welcome constructive criticism, so if something is wrong, missing, confusing or unclear, I’d love to hear from you! What is your “vegan level”? Sceptic – I don’t have much sympathy for the vegan movement. Curious – I don’t know much about the vegan movement, but I’m open-minded and interested. Novice – I’ve just started my vegan journey. How do I have the best experience? Experienced – I’ve been vegan for some time now. I’m convinced and I’d like to explore further.